All images on this website are copyright protected and may not be copied or reproduced without the expressed written consent of the artist, Evelyn M.Breit. 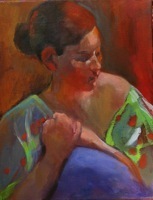 Evelyn M. Breit captures the beauty and complexity of the human form in all its variations. Her luminous, award winning work transcends conventional concepts of figurative art. an exciting new level of vibrant, creative expression.